On Saturday, July 18, the Middleborough Historical Commission and Rock Village Church sponsored an historic walking tour of a portion of Rock Village. For those readers who may have missed the well-attended event, a self-guided tour which may be printed appears below. 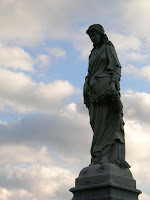 This tour encompasses Miller Street from the Rock Church south to Highland Street with brief excursions to the Rock Cemetery and the Rock on Walnut Street. Several of the sites are associated with either the Rock Village Church or the Rock Mill. Use caution while walking along the roadways at Rock, many of which are without sidewalks, and please respect the private properties which are being viewed! The tour takes approximately an hour and a half and provides both a pleasant leisurely walk and an informative introduction to Rock's history. Rock Village Church (1880), 94 Miller Street. In 1879, the Independent Congregational Church was organized at Rock by 20 parishioners of the Third Baptist Church on Highland Street under the guidance of Reverend W. Clarkson Ryder and the following year this “commodious chapel” was erected, being dedicated in June, 1880. The church emphasized the doctrine of scriptural Holiness and consequently became known as the “Holiness Church.” It was here in 1890 that representatives of various Holiness congregations met and organized the Central Evangelical Holiness Association which became the foundation for the Church of the Nazarene. 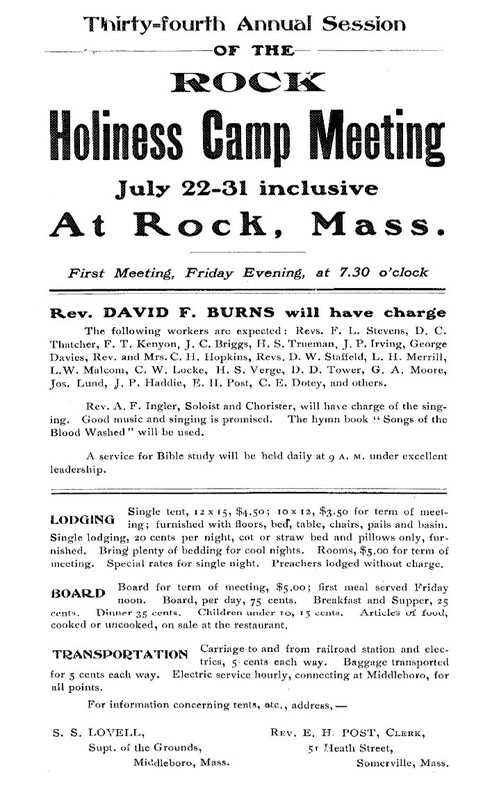 Following the destruction of the Third Calvinistic Baptist Church on Highland Street in 1918, the two churches merged and continued to meet here, being known for a time as the Rock Village Federated Church. In 1920-21, the chapel was enlarged and the steeple added to give the church its current appearance. Site of Rock Village Station (1848-1938). 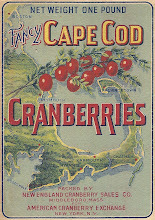 In 1846, the Cape Cod Branch Railroad was incorporated for the purpose of constructing a rail line from the existing Fall River Railroad line from near that company’s depot at Middleborough center to Sandwich on Cape Cod. A site was selected for a station at Rock where the line crossed Miller Street. As elsewhere, arrival of the railroad opened Rock to new markets and was the impetus for the development of the village’s lumber industry. The line was constructed by Irish laborers throughout 1846 and 1847 with the first fifteen miles between Middleborough center and Wareham opening on January 26, 1848, though the first train had passed through earlier on May 29, 1847. Despite the convenience of the railroad, ridership remained relatively low, and the bulk of the railroad company’s receipts were derived from freighting. Rock residents successfully opposed proposals by the railroad to close the Rock and South Middleborough stations and create a new station midway between the two communities. The view of Rock residents was supported by the state which maintained that such a plan would disrupt the habits which had arisen since the establishment of the railroad. Nonetheless, in 1867 Rock was made a flag stop with the flagman being required to signal approaching trains to stop. The flagman also had other duties such as ensuring the safety of pedestrians and vehicles which crossed Miller Street at grade. This remained an important part of the flagman’s role until 1929 when electric crossing signals were installed. Passenger service was finally abandoned in 1938 by the Old Colony’s lessor, the New York, New Haven & Hartford Railroad which closed the Rock station. 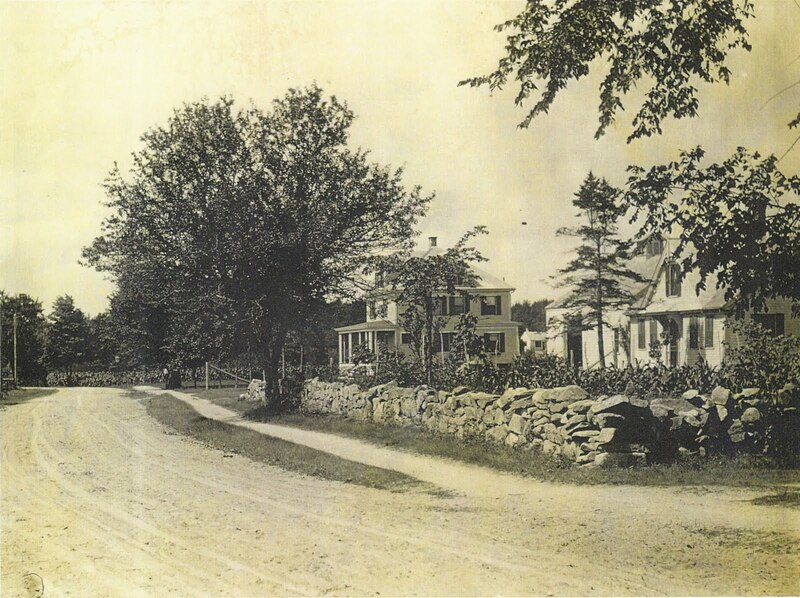 Another transportation revolution for Rock came in 1901 when the Middleboro, Wareham & Buzzards Bay Street Railway constructed a trolley line from Middleborough center to Wareham which passed through Rock Village, running along Miller Street to Smith Street where it made a 90-degree turn before running back to Wareham Street. By July 3, 1901, the line had reached Rock, with cars tested on the line later that month making the run between Middleborough and Rock in 15 minutes. 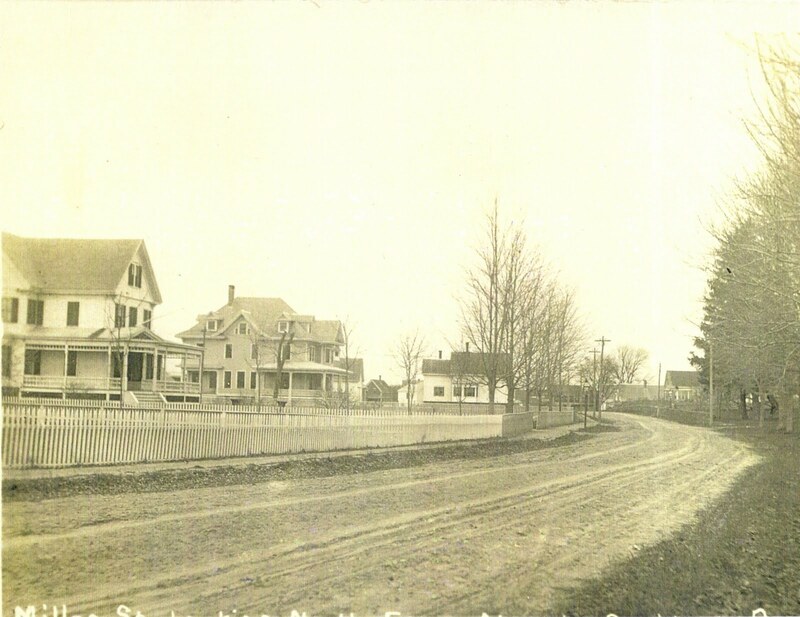 The street railway provided Rock residents with easy access to Middleborough and other points, and offered more frequent service than the steam railroad, ridership on which began to decline. The street railway, itself, was abandoned in 1923-24 and replaced first by jitneys, and later by buses. Israel Smith House and Store (c. 1845), 88 Miller Street. This structure at the southeast corner of Miller and Smith Streets long housed Israel Smith’s grocery and dry goods store. Born at South Middleborough, Smith (1817-1902) relocated to Rock in 1842 at which time he opened a store which he operated until 1901. 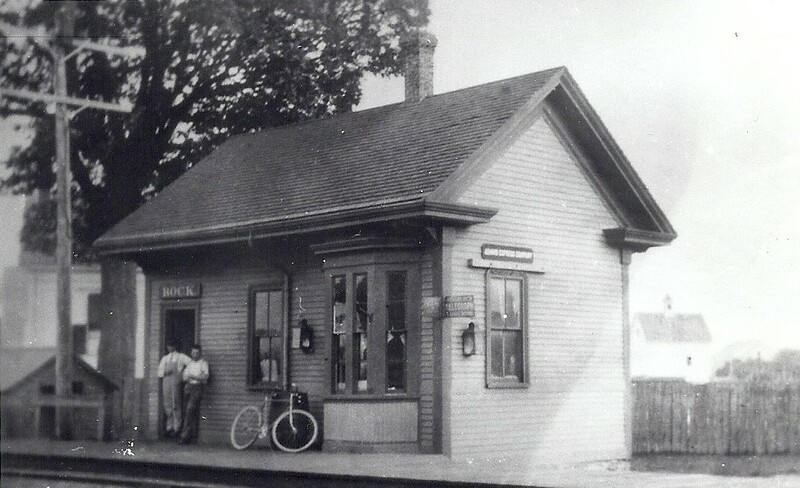 “In early days he purchased his goods in Plymouth, where they were brought by vessel, and transported them on ox teams to his store.” Smith was instrumental in the location of a railroad station at Rock by the Cape Cod Branch Railroad and he served as the first station agent there, as well as Rock’s postmaster for nearly 40 years. 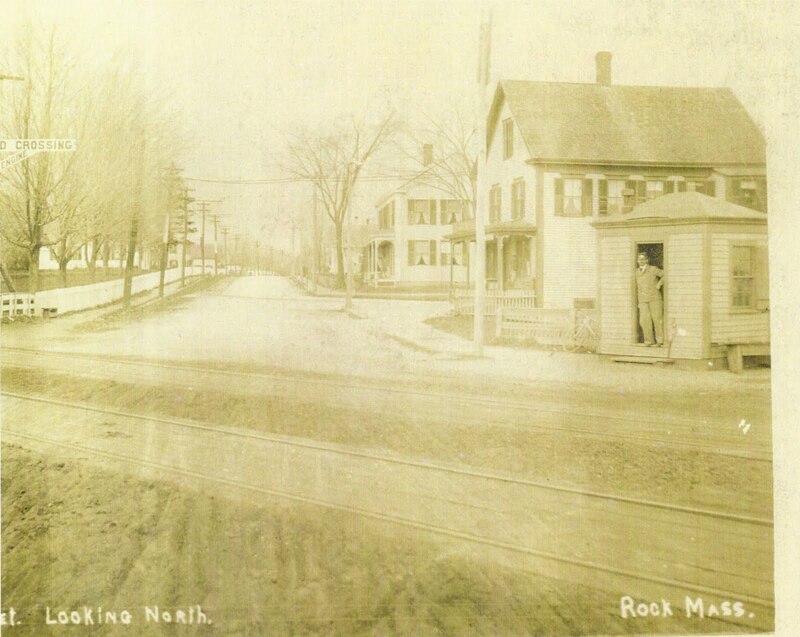 An early promoter of the Rock mill, Smith was the oldest resident of Rock at the time of his death in 1902. By the turn of the century, Joseph C. Turner was operating the store here. He was succeeded in 1906 by Walter C. Thomas. 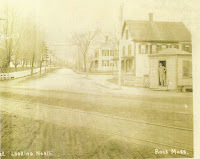 The building is noteworthy for having been the first building at Rock to be wired for electricity during Thomas’ tenure as shopkeeper, shortly after the electrical line was extended to Rock in 1912. It was also likely the first building at Rock to have a telephone, which was installed in the 1880s. It was in this building as part of Smith’s store that the Rock post office was located. Established in 1849, the post office operated until 1934 when fourth class post offices were closed and replaced with the rural free delivery system. former Rock Village Store (late 19th century), 91 Miller Street which began life as a stable and a house at one time occupied by the caretaker of the Levi O. Atwood estate further south on Miller Street. 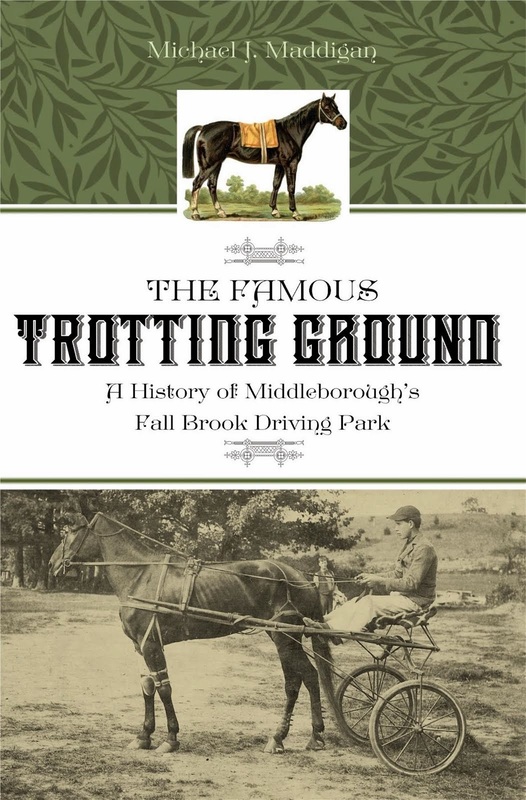 In 1938, Atwood sold the house and stable building to James T. McKechnie who operated the Puritan Market on Wareham Street at Fall Brook and who proposed converting the stable into a store. It is said that the stable served as an air raid shelter (fortunately never used) during World War II. The operation served as a store under various owners until the late 20th century. 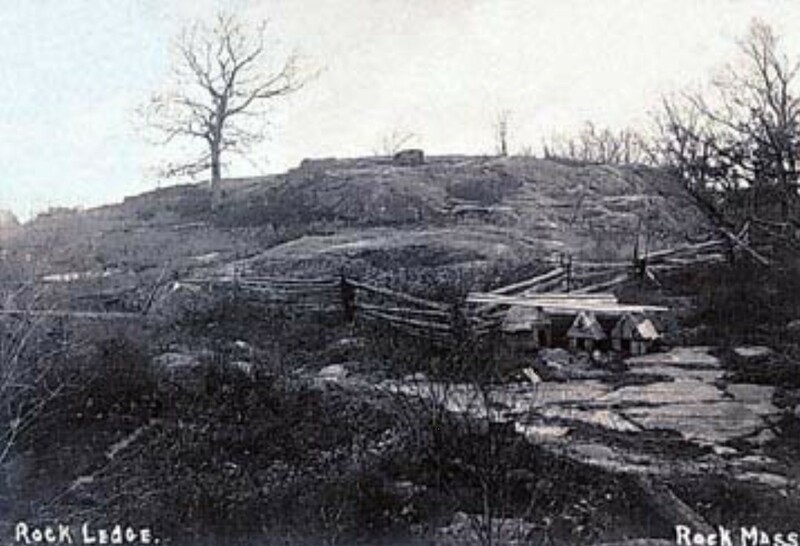 Site of the Rock Mill (1865, burned 1939) which occupied a large parcel between Walnut Street and the railroad line. The mill was operated by various firms over the years though it was long informally known as the Rock mill. The lumber and box-making mill was established in 1865 as the Rock Mill, and was powered by a 20 horse power engine and employed 9 operatives. In 1868, it was acquired by H. N. Thomas and operated as one of the largest sawmills in Middleborough as H. N. Thomas & Company. Ten years later, Charles N. Atwood acquired the mill and under his direction it “became one of the successful industries in this section in the manufacturing of wooden boxes”, ultimately employing some fifty men. The 2-story mill building was located on Walnut Street. Sawing and planning was done on the first floor while box-making was conducted on the second floor. Atwood’s son, Levi O. Atwood (1870-1949), was a member of the firm briefly between 1891 and 1893 before joining permanently about 1903 or 1904 at which time the firm became known as C. N. Atwood & Son. 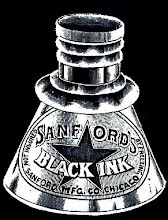 In 1914, the elder Atwood retired and control of the business was assumed by Levi O. Atwood, the name of the company being changed at the time to reflect the change in ownership. The L. O. Atwood Company survived a devastating fire in 1922, but it ultimately succumbed to business pressures during the Depression, and between 1934 and 1937 the plant remained idle. The plant, in fact, was rebuilt, but operated on a much smaller scale until June, 1956, when the forced bankruptcy of the Rock Manufacturing Company resulted in the sale of the property. At its peak, the Rock mill was an enormous operation. By 1925, on average, 2 million board feet of lumber were stacked in the yard which surrounded the mill on the north and west and it was the largest manufacturer of wooden boxes and box shooks in southeastern Massachusetts. One of the few remaining buildings from the Rock mill plant is the Levi O. Atwood Mill Boiler House (1922; rebuilt 1939), 9 Walnut Street, with its prominent smokestack. The boiler house was constructed in 1922 using elements from the earlier power plant to provide electrical power to the company’s adjacent box mill. The building housed a 250 horsepower steam-powered electrical generating plant to power the mill machinery. The boiler house was substantially rebuilt again following a fire on June 29, 1939 and remained in use until the mill became obsolete. The plant’s chimney with its decorative brickwork was long prominent on the Rock skyline. It is an interesting example of early 20th century industrial architecture. Rock is visible on either side of the road, with a particularly large mass to the left. The outcropping or exposed ledge covers a considerable area and distance on the west side of Miller Street. In the days when the surrounding land was cleared for agricultural purposes, the rock was much better exposed and formed a prominent geographic landmark. Further south, near where the ledge meets Miller Street, early residents held religious services outdoors near the rock, and the noteworthy practice helped give the community its name. Though efforts were made following the Civil War to exploit the granite ledge, the effort was not a commercial success. Rock Village Library (1905), 96 Miller Street which was initially used as a store by Harvey N. Atwood and following 1926 by Walter C. Thomas. Atwood had been a provisions dealer at Rock since about the time of his marriage in 1868, first at Miller and Smith Streets and later here. In its later years, the store operated as Atwood & Company and in 1895 advertised “We carry as fine and varied a stock of General Merchandise as can be found in any city,” selling dry goods, grain, groceries, wall hangings and other merchandise. Sometime in the 1890s, Atwood constructed a store building here, which caught fire and burned in March, 1905, severely damaging the neighboring chapel building in the process. The present building was built during the summer of 1905 by contractor B. F. Phinney. In later years, Atwood retired from the grocery business, though the building was rented for commercial use. One tenant appears to have been a branch of the A&P which vacated the building in the fall of 1925. In 1926, Walter C. Thomas acquired the operation and continued it through 1936 when it was closed. Between 1946 and 1974, the building was the home of the Rock Village Library. In 1930, the Rock Village Library was organized as a private lending library, acquiring this building in 1946. 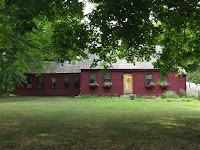 Benefactors of the library which operated until 1974 included Mr. and Mrs. Henry A. Wyman, summer residents at Chippoponquet on Long Point Road (now the Stuart Morgan Conservation Area). The Rock Village Library was notable for not only the service which it provided, but for the fact that it helped provide Rock with a continuing sense of identity, particularly during the 1930s which proved a difficult decade for Rock, with a number of long-standing institutions closing including the Rock mill and Rock post office in 1934, the Rock store in 1935 and the Rock station in 1938. Harvey N. Atwood House, (c. 1892), 98 Miller Street. Atwood (1849-1935) was a store owner at Rock for many years. He was the son of Ichabod F. Atwood and brother of Charles N. Atwood (1844-1938). 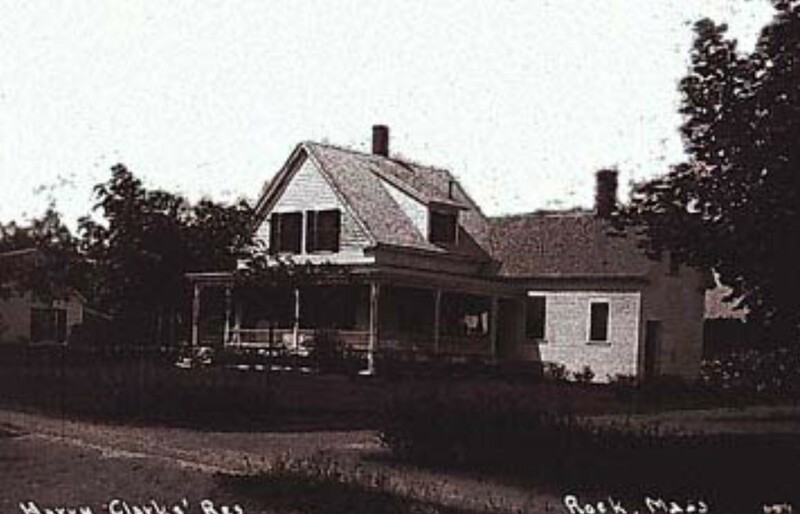 Between 1936 and 1946, the house was owned by the Rock Village Library. Ryder died in 1905 and many attributed his death to shock upon hearing of the suicide the previous day of his friend and religious co-worker Jabez Frank Smith who hanged himself from a pine tree in the woods at Rock. 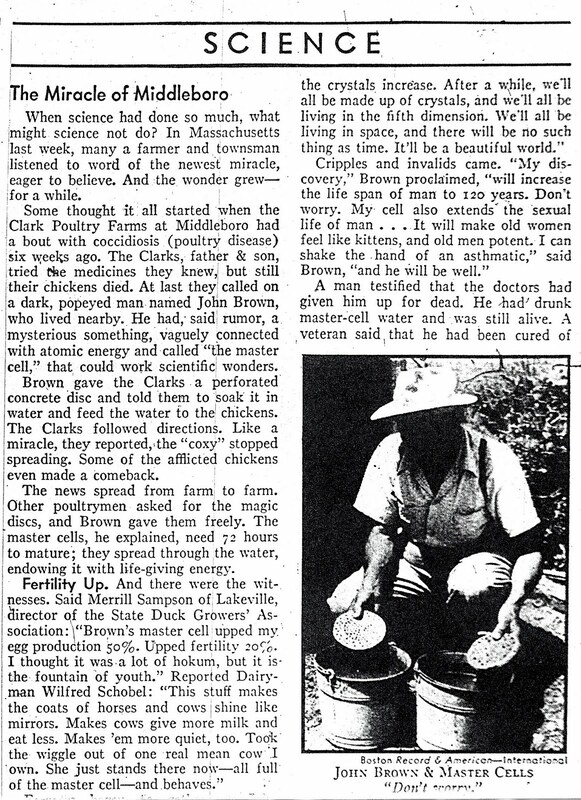 Later, in the 1940s and 1950s, the house was occupied by Farmer [John C.] Brown who achieved national notoriety for his master cells which claimed to promote plant and animal growth and health. According to Brown in 1948, the cell “takes all the fight and hatred out of men and animals alike. It will prevent disease and pestilence. It will prevent famine. It will make pigs fatter; make cows produce more milk. It makes the atom bomb obsolete … The master cell is my God, and it will bring peace to all men.” Despite a number of testimonials attesting to the efficacy of the cell, the Food and Drug Administration judged the cell a fraud and prohibited its sale or promotion. During Brown’s brief period of fame, he was featured in national periodicals, including Time magazine. William F. Clark House (c. 1903), 120 Miller Street. William F. Clark was originally engaged as a teamster doing general work hauling loads. This experience undoubtedly led to his being Middleborough Road Surveyor. Clark purchased 17 acres here at Rock for the construction of this house. Clark resigned his position with the town, and for a period of time was employed at the Atwood Mill further north on Miller Street. He resigned his position as foreman of outdoor work at the mill in 1929. Later, the house was occupied by Sylvester Greene. Rock Baptist Parsonage (c. 1872), 126 Miller Street. 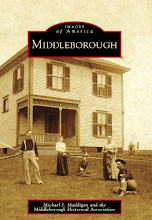 In 1872, the Third Baptist Society of Middleborough acquired the property here from the estate of Lucetta B. Ewer, and constructed the parsonage thereon. In 1872 the former parsonage was sold. This house remained used for this purpose through the early 20th century. The house was occupied in 1934 by Bradford Westgate (1853-1939). In 1934 shortly before the Rock mill closed, Westgate was noted as the mill’s longest serving employee, having entered its employ in the fall of 1891, where he was engaged as a boxmaker. Rock Cemetery and Mortuary Chapel (1925), Highland Street. The Rock Cemetery is comprised of five historic cemeteries: the Old Burying Ground to the west of the Memorial Chapel, the East Burying Ground to the east of the chapel, and the Ewer, Thomas and Hope’s Rest Cemeteries on the south side of Highland Street. In 1907, control of all five was assumed by the Rock Cemetery Association which has provided for their care since that time. The Rock Cemetery Mortuary Chapel, now occupied by St. Andrew’s Traditional Anglican Church, sits on the site of the Third Baptist Church of Middleborough. The first church on the site was dedicated in the mid-1790s and sixty years later, a replacement was built in 1852. Of this church it was stated that “seldom is a country church more beautiful than was Rock Baptist church.” This church was destroyed by fire on December 4, 1918, when lightning struck the roof of the church. The sermon delivered the Sunday following the calamity by Reverend M. F. Johnson took as its text Isaiah 64:11, “Our Holy and Our Beautiful House, where our fathers praised Thee, is burned up with fire, and our pleasant things are laid waste.” In 1925, the Mortuary Chapel was constructed to a design by local architect Wilson G. Harlow of Middleborough who also designed the original Central Fire Station on North Main Street in Middleborough as well as the original portion of the Mayflower Co-operative Bank on South Main Street. The chapel assumed the functions of the earlier cemetery receiving tomb while providing a suitable place to hold burial services. 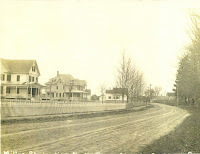 Original portion of Miller Street. This drive way on the left at the intersection of Miller and Highland Streets is an original portion of Miller Street which took a 90-degree turn to the west here. In 1927, under the direction of the County Commissioners, this corner was eliminated and the safer bend created. Further west, yet another section of the road was abandoned, though it still exists under the name Old Miller Street. Henry C. Tinkham House (1907), 129 Miller Street. The Tinkham family for a number of generations had been prominent at Rock and this house as well as the nearby houses at 125 and 123 Miller Street are associated with members of the family. Though the parcel of land on which the house stands was acquired in 1893 from the Marchant heirs, the house was not built by Henry Clay Tinkham (1854-1929) until 1907. Tinkham was engaged as a dealer in lumber, horses and cows, though he is perhaps best remembered as an avid hunter of fox, raccoon and rabbits, the pelts of which were sold. 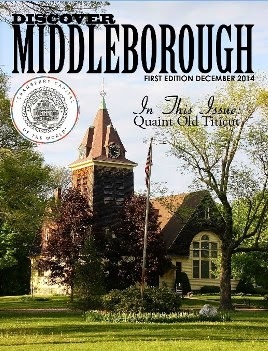 The Middleboro Gazette of the period contains numerous accounts of Tinkham’s successes in this line. Tinkham was well remembered in the neighborhood. “Mr. Tinkham was of a genial nature, generous, kind hearted, an excellent neighbor and a loyal friend…. A home loving man, none could hold a higher place in a home.” The house is perhaps most noted for its field stone walls which feature a number of quartz rocks which give the walls their variegated appearance. Ephraim Tinkham House (1767), 125 Miller Street, one of the oldest extant houses in Rock Village. 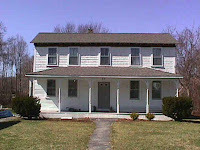 The house is believed to have been constructed by Ephraim Tinkham in 1767 and owned by the Tinkham family for several years. In the early 1800s, it was occupied by Reuben Gibbs who sold the house in July, 1865, to Reverend Seth Ewer. Ewer served 54 years as a preacher, though some didn’t think much of his preaching. Dr. Leroy Milton Yale of Tisbury stated rather harshly that Ewer was not well received by the people there and was not much of a scholar, calling Ewer’s sermons “long, …uninstructive and often quite irksome.” In 1873, Ewer’s heirs sold the house to George Marchant, a farmer, and in 1893 it was acquired by Henry C. Tinkham whose sister, Martha T. Smith appears to have occupied the home for a time. Between 1936 and the late 1980s, the house was owned by Henry C. Tinkham’s grandniece, Eva A. (Shaw) Griffith and her husband Edward. In 1990, it was acquired by Lee Smith who restored the house to its original appearance which is indicative of the homes of Rock’s mid-18th century residents. Adaline A. Shaw House (between 1879 and 1895), 123 Miller Street. This house was occupied by the Shaw family for about 100 years, beginning with Adaline A. Shaw, the widow of Henry W. Shaw (who was the sexton of the Rock Cemetery) and the sister of Henry C. Tinkham. The house was later occupied by Adaline Shaw’s grandson Washington Henry Shaw (1896-1983) and his wife, Irene. Murdoch G. Hartling House (1923), 121 Miller Street. 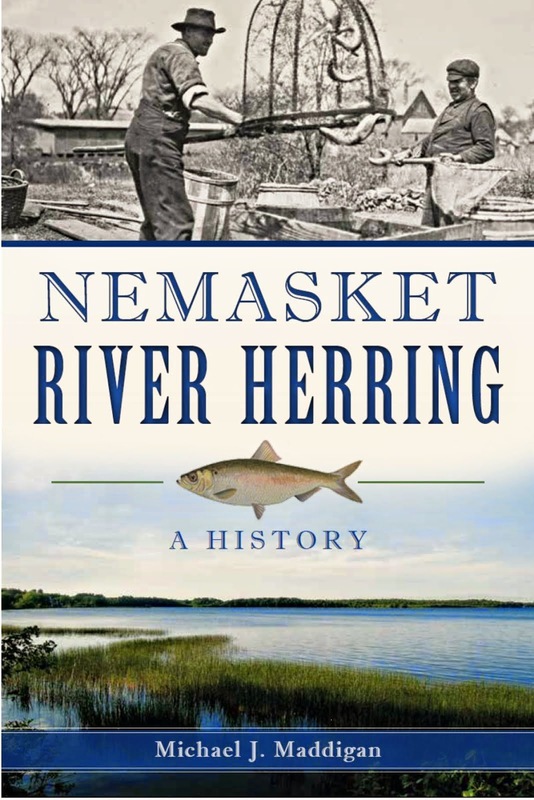 A native of Canada, Hartling (1887-1984) was an employee at the state farm in Bridgewater as well as the Rock mill. This house represents the type of small family home built during the period. Barrows-Morton House (early-mid 18th century), 115 Miller Street. This house is reputed to date from early in the 17th century and was owned for much of its history by the Barrows and Morton families. In 1836, the house was sold by Abner C. Barrows to his sister Lucetta (Barrows) Morton Ewer (1801-87) who occupied it along with her two husbands, Seth Morton (1792-1847) and Reverend Seth Ewer (1791-1870). 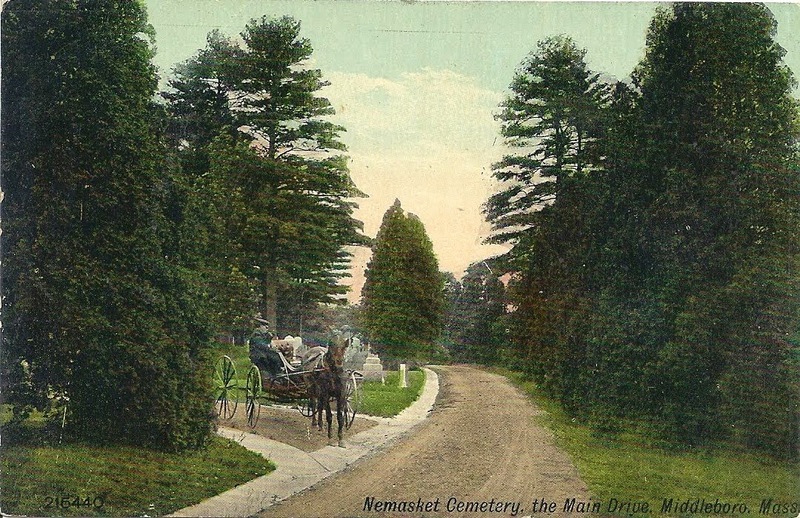 Mrs. Ewer was the granddaughter of Nathaniel Barrows, the original benefactor of the Rock Cemetery, and she continued the family tradition by maintaining a private burial ground later known as the Ewer Cemetery on Highland Street. 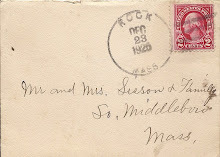 Mrs. Ewer concluded what was undoubtedly one of Middleborough’s earliest pre-nuptial agreements upon her marriage to her second husband, Reverend Seth Ewer in 1863, keen to protect her assets which included her homestead here and the Ewer Cemetery, for the benefit of her children by her first marriage. Having agreed to marry each other by the leave of Divine Providence, and whereas we both have children living and have more or less real estate and personal property we hereby mutually promise and agree to waive all legal claims to each others property either real or personal estate, in case one outlives the other and thus abide each the others last will and testament whatever that may be as found written and executed at the death of either party. 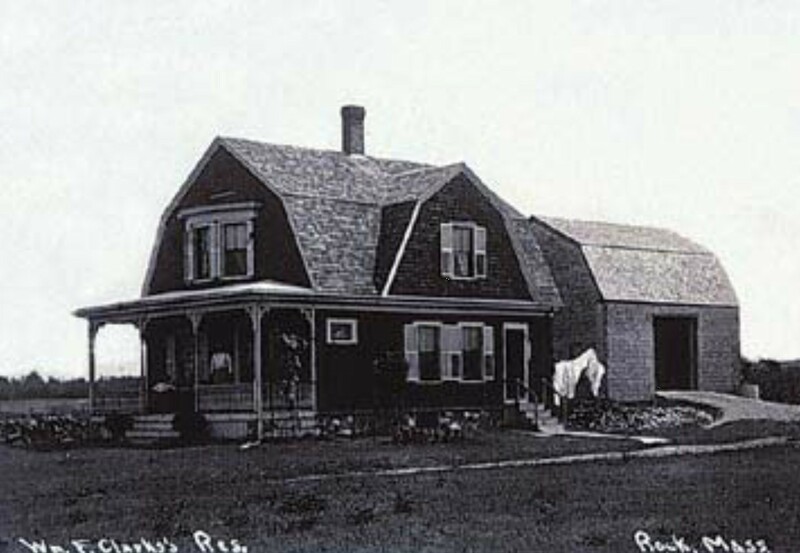 The house was later occupied by Mrs. Ewer’s son, John Q. Morton (1827-1896), who was the station agent at Rock as well as the postmaster following 1889. 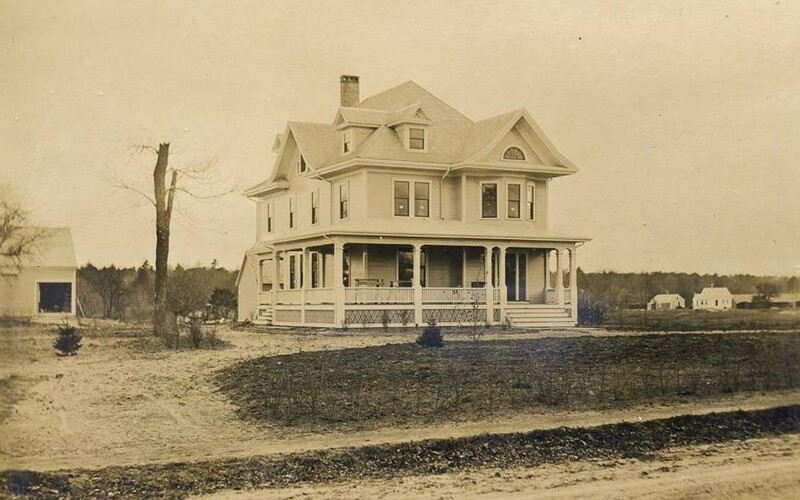 Still later, the house was occupied by Morton’s daughter, Hannah H. Morton (1857-1933) and it remained in the Morton family until 1936 when it was sold to Colonel Victor page of Stamford, Connecticut. Harry Clark House (late 19th century), 113 Miller Street. This house was occupied in the early 20th century by Harry Clark, brother of William F. Clark, and an employee in the Rock mill. Following Atwood’s death, his son Charles retained ownership of the property which was rented to various residents over the years. 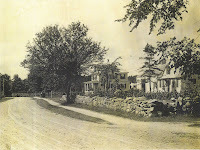 In 1906, Charles W. Swett moved here from his property which he sold to Levi O. Atwood for the construction of Atwood’s house. Charles N. Atwood House (c. 1886), 109 Miller Street. 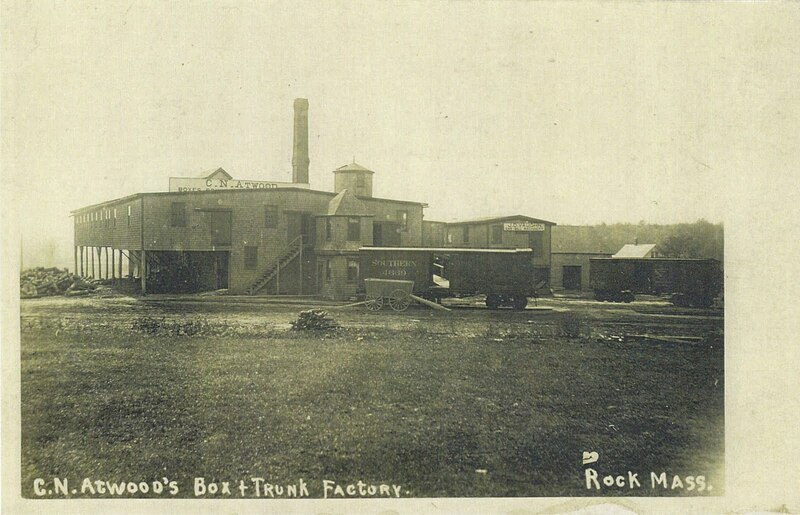 Charles Nelson Atwood was a box manufacturer at Rock, and his mill was responsible for providing employment to numerous Rock residents throughout the years. In 1878, Atwood acquired the mill founded by his father from Horatio N. Thomas and under Atwood’s direction it “became one of the successful industries in this section in the manufacturing of wooden boxes,” ultimately employing some 50 men. Atwood was considered a sympathetic employer, sponsoring annual outings for his operatives and their families, including clambakes, beach excursions, sight-seeing jaunts and shopping trips. Of him it was said that “while many employers may have the means to provide such a pleasure day but few have the inclination.” More notable was his action to increase the wages of his employees in early 1903. “Atwood … called a meeting of his men Saturday, when it was about time to pay off, and told them that of his own free will he had concluded to give them 10 hours’ pay for nine hours’ work, the new schedule to go into effect” immediately. Atwood was able to parlay his success as a prominent local manufacturer into a political career serving as a Middleborough selectman and later as a Massachusetts Representative. Atwood’s first wife, Ruzilla (“Rosie”) Amanda Barrows (1846-74) was a great-granddaughter of Nathaniel Barrows who deeded the land for the Rock Cemetery in 1803. Atwood was the father of Alton B. Atwood, Levi O. Atwood and Ichabod F. Atwood, all of whom became prominent wooden box manufacturers in Massachusetts. 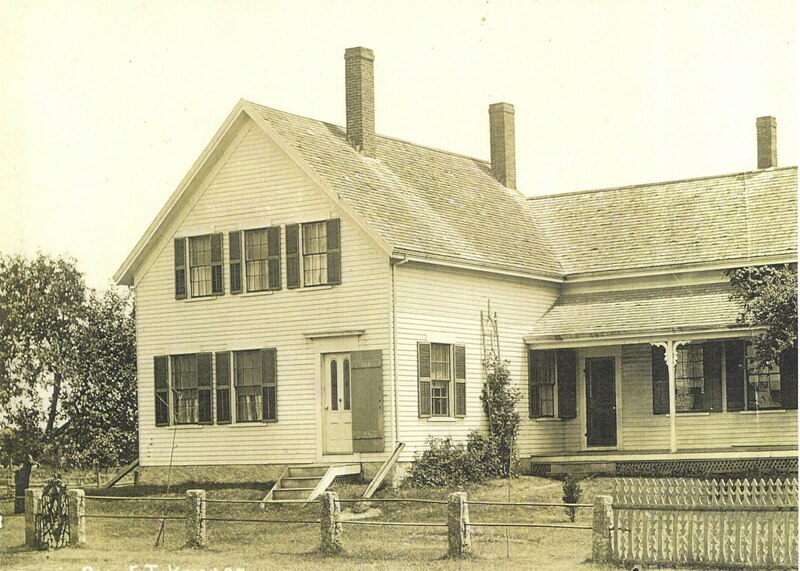 In March 1886, Atwood purchased the land on which the house was erected from his father, Ichabod F. Atwood. 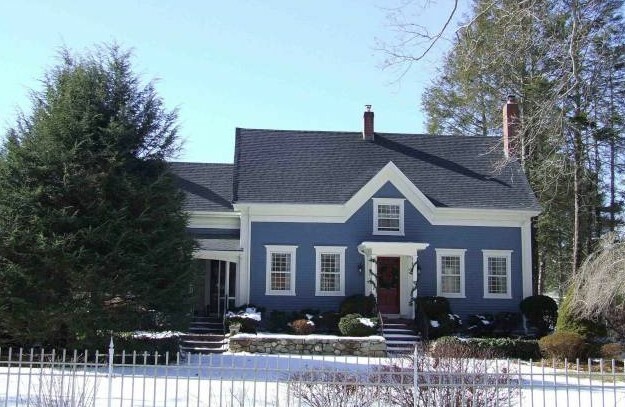 The house Atwood constructed in the Eastlake style reflects Atwood's prominence within the community as well as the growing wealth of the family. Atwood was the first person to own an automobile at Rock, acquiring it in 1901, and in 1907 he built an "automobile house". The Charles N. Atwood House now houses the Rock Village Bed & Breakfast. Levi O. Atwood House (1906), 103 Miller Street. Charles N. Atwood’s son, Levi O. Atwood (1870-1949) was a member of the C. N. Atwood milling operation briefly between 1891 and 1893 before joining permanently about 1903 at which time the firm became known as C. N. Atwood & Son. Levi O. Atwood operated the mill until the economic climate of the 1930s prompted its closure in 1934. 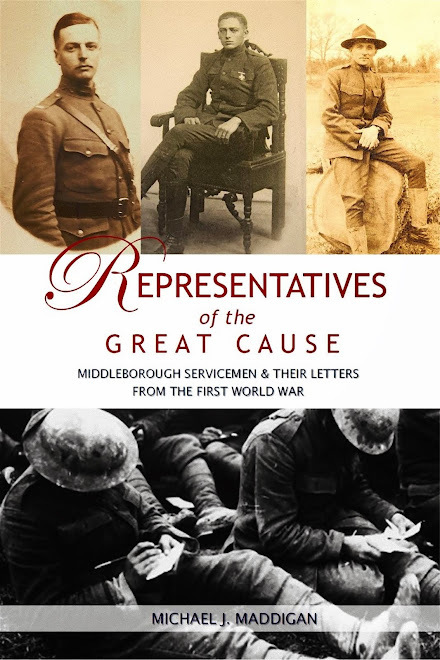 Like his father, Levi O. Atwood was a Middleborough selectman, and he served three local banks at Middleborough as trustee, director or officer for several years, demonstrating the influence which the Atwood family held. Atwood purchased the property from Charles W. Swett and had the existing buildings relocated elsewhere (presumably Walnut Street) in order to create space for his new house, ground for which was broken in March, 1906. Joshua K. Bishop House (c. 1895), 99 Miller Street. Joshua K. Bishop (1852-1919) came to Rock from Walnut Plain in 1894, acquiring the property here. He was the brother-in-law of Charles N. Atwood and not surprisingly found his employment in the Rock mill. In the period immediately following Bishop’s death, the house was rented to various parties including Alfred Shurtleff of the Highlands who resided here between 1920 and 1921. In 1922, the house was sold to Oscar Westgate. Martha T. Smith House (date unknown), 97 Miller Street. In 1908, Martha T. Smith (1856-1933) acquired a vacant lot here, formerly part of the Swett farm, from Levi O. Atwood. It is likely that the house was moved here from another site, possibly from the site of Levi O. Atwood’s house, or from the Rock mill. Mrs. Smith was the daughter of Isaac Tinkham, the sister of Adaline Shaw and the wife of Roland Smith. Sometime after 1926, she went to live with her grandniece Eva Griffith in the Ephraim Tinkham House at 125 Miller Street. Following Mrs. Smith’s death, the house was left in trust to benefit the children of Washington Henry Shaw. Since that time, it has had several owners. It is nearly identical in appearance to the Shaw House at 123 Miller Street. Conclude the tour by returning to the Rock Village Church. To learn more about Rock's history, read Elysian Fields: An Illustrated History of Rock Cemetery, available at the Middleborough Public Library or for purchase through the Rock Cemetery Association. All proceeds benefit the cemetery.